For the third time now, I headed to Sunset Park to give a studio visit in the building that also hosts the studios of Hauser, Heidkamp and until this past summer, Wozniak. This time I was happy to be visiting with Rob Nadeau who has come to the building from Dumbo. These spaces are super sweet, always a nice amount of room for storage, fabulous windows for daytime light and famed sunset, and more then ample wall space. In the far right corner, bellow a couple of windows outlining the fast pace of the BQE, Nadeau had a keyboard and a bass guitar set up. Stuck on the wall behind the keyboard where some words with musical notes written out above them. 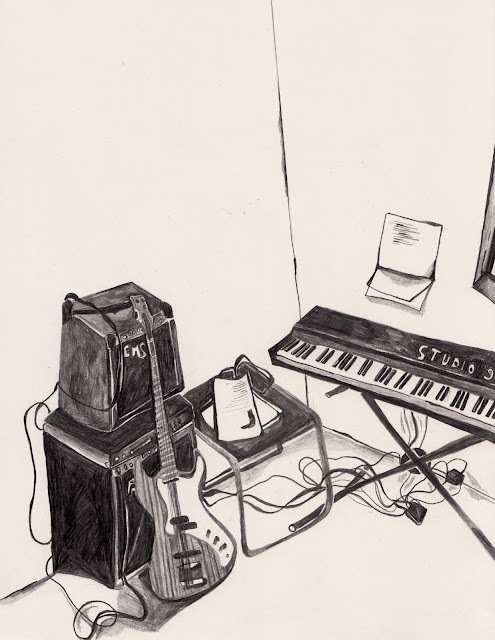 His space acts, not only as an art studio, but also a music studio. What a great thing to be able to go back and forth from painting to playing in just a couple of steps. I imagine it would keep you active in those oh so frustrating down times in the process of making. Nadeau had up several pieces on the wall that where fairly new and had one piece laid out on the floor, a work in progress. 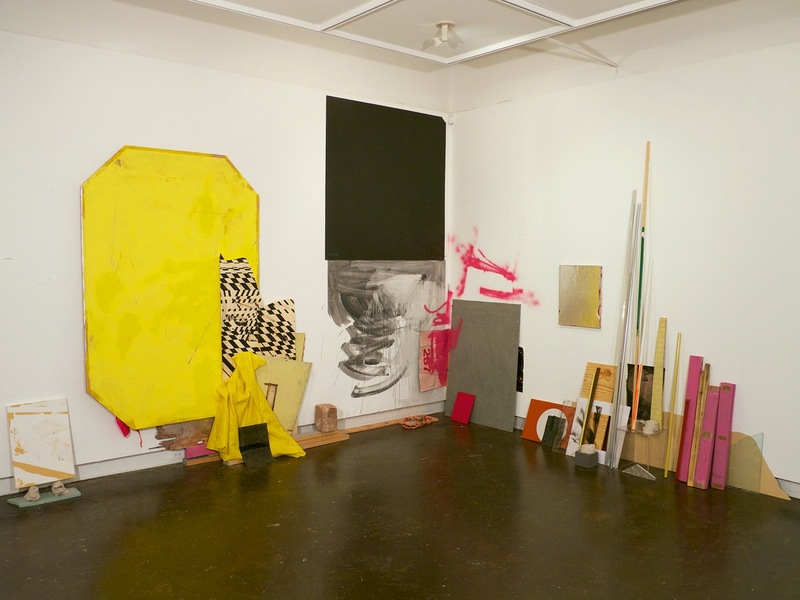 Nadeau's new works, with their array of hyper-subtle paint strokes, appear much bigger then they already are when looking at them for the first time. It is easy to feel your body engrossed by their otherworldly expanse. The pigments he uses are often laced with flecks of metal be it graphite or metallic paint. The surface glistens at times, its high and low lights changing depending on the stance of the viewer. It brought to mind the wash of water over a bed of mineral infused rocks or, as Rob spoke about quite extensively, the effects made by a step in photo processing. 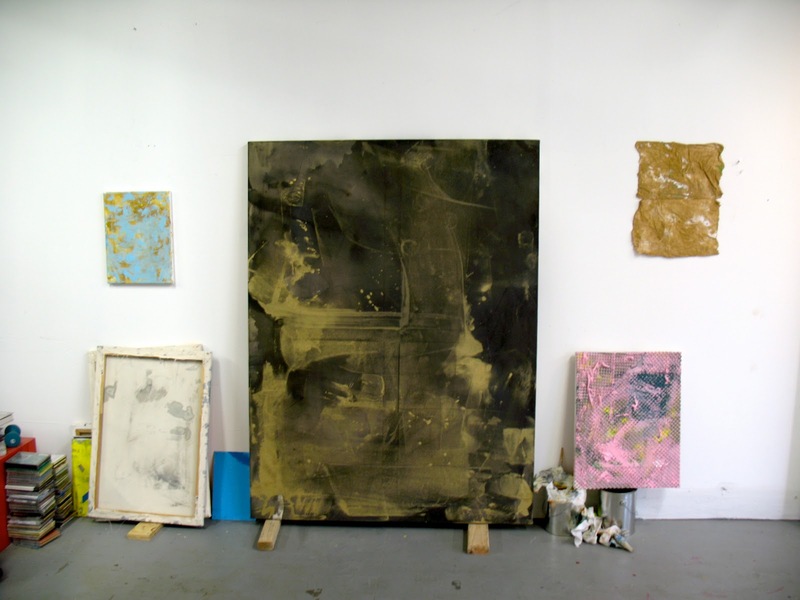 It is as though the large canvas had been agitated in a development bath, where the light and chemicals played on the surface, leaving behind flowing traces of movement. 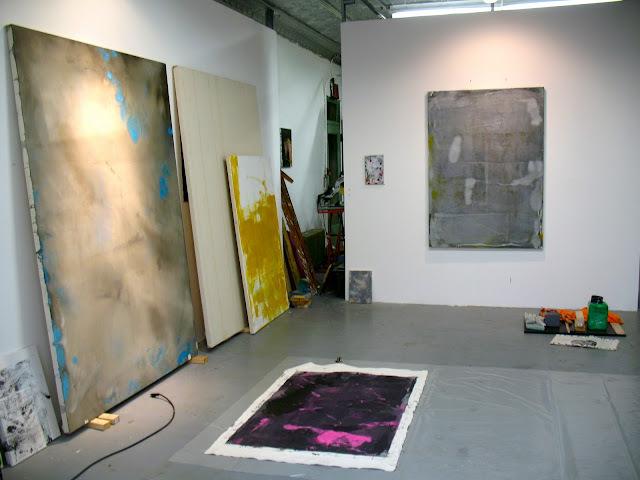 Nadeau explained that he often works on the canvas on the floor before stretching it. You can almost see the action of the swing of his arm in the marks. There were a bunch of rags used for this swing piled on the floor next to the painting. Rob and I talked about the time it takes to live with a painting when the placement of the paint can take seconds, but the next move can take weeks. You have to use a special kind of restraint to make this kind of work, in order to leave behind the details most important untouched. Nadeau has got it down. 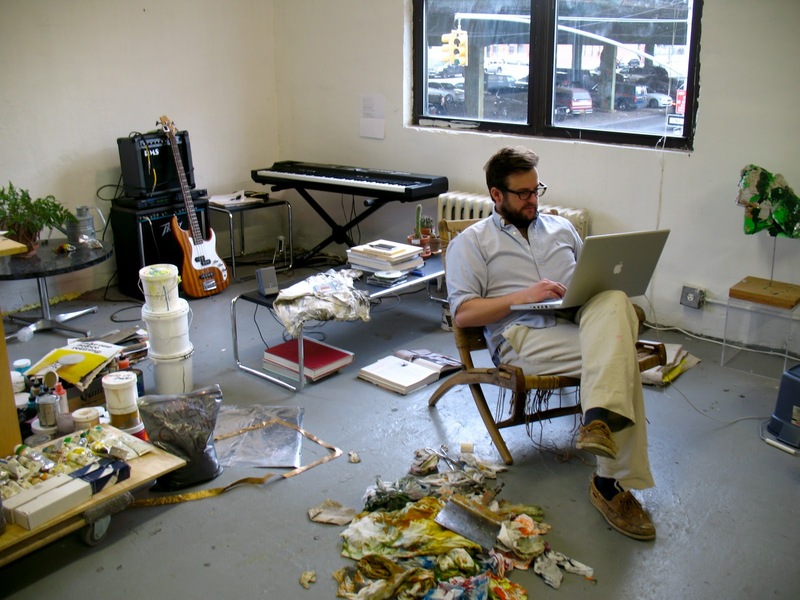 He shared with me online images of the two sculptural-painting installations he had done a few months ago, one at Georgia State University in Atlanta and one at The University of Tennessee in Knoxville. It was a busy fall for Mr. Nadeau it would seem. For both of these shows he shipped completed work down from Brooklyn and went foraging to various locations around the two cities he was visiting to gather the rest of the materials for the installations. City site specific. 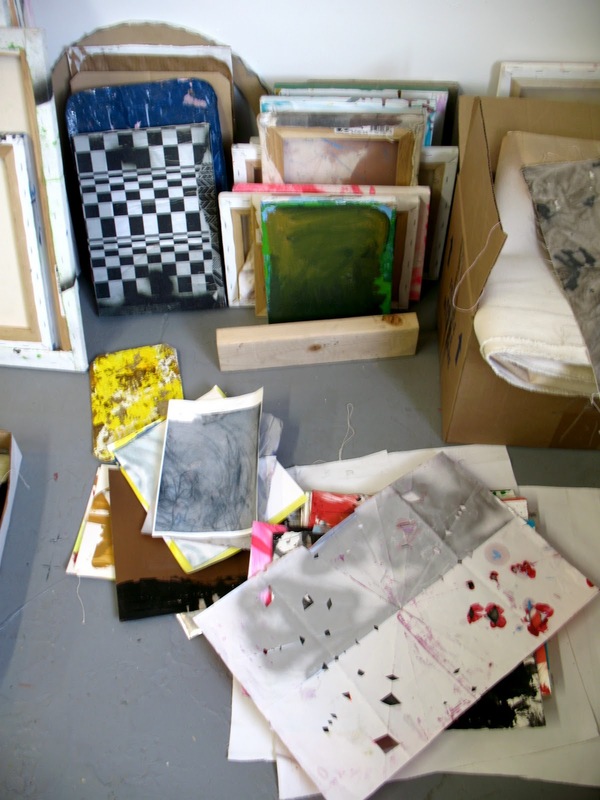 There was so much to look at in Nadeau's studio, I wanted to lift up every piece of paper or drawing, to find the one underneath. 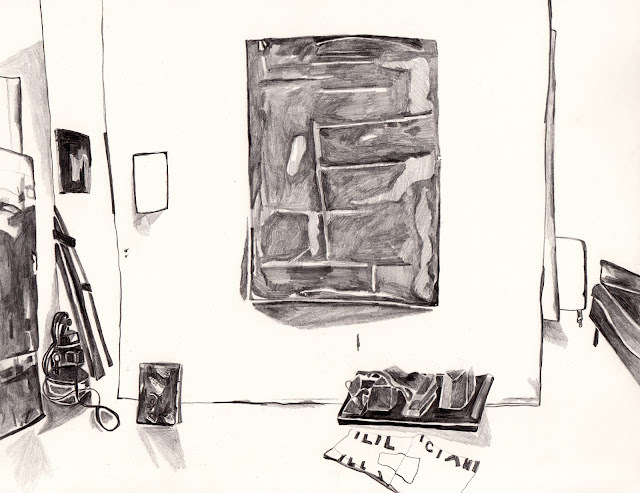 I was lucky enough to have him bring out some small drawings he had made while teaching a semester at UT. He said he had used graphite stones from the shore of the Narraganset Bay in RI for much of these small works, drawing with the stones. One of them looked like it could be a ten foot tall painting as I held it in my hand gently not to disrupt its faint marks. I didn't get to hear Rob play his music during this studio session, but had heard him play weeks prior when he busted out some tunes on a piano at a party we were both at. Man can he jam, and so can his paintings. Please check out more of Nadeau's work at http://www.robnadeau.com/. Great post! Love his work!